Private First Class West was a member of Weapons Company, 1st Battalion, 7th Marines, 1st Marine Division. He was Killed in Action while fighting the enemy in Korea on December 8, 1950. His remains were not recovered. Private First Class West was awarded the Purple Heart, the Combat Action Ribbon, the Korean Service Medal, the United Nations Service Medal, the National Defense Service Medal, the Korean Presidential Unit Citation and the Republic of Korea War Service Medal. He is Private First Class Carl A. West, U.S. Marine Corps, of Amanda Park, Washington. He will be buried October 4, 2007, in Arlington National Cemetery near Washington, D.C.
West was a member of Weapons Company, 1st Battalion, 7th Regiment, of the 1st Marine Division deployed near the Chosin Reservoir in North Korea. On November 27, 1950, three Communist Chinese divisions launched an attack on the Marine positions. Over the next several days, U.S. forces staged a fighting withdrawal to the south, first to Hagaru-ri, then Koto-ri, and eventually to defensive positions at Hungnam. West died on December 8, 1950, as a result of enemy action near Koto-ri. He was buried by fellow Marines in a temporary U.N. military cemetery in Hungnam, which fell to the North Koreans in December 1950. His identity was later verified by the FBI from a fingerprint taken at the time of the burial. During “Operation Glory” in 1954, the North Korean government repatriated the remains of 2,944 U.S. soldiers and Marines. Included in this repatriation were remains associated with West’s burial. The staff at the U.S. Army mortuary in Kokura, Japan, however, cited suspected discrepancies between the dental remains and West’s dental file as well as discrepancies between the biological profile derived from the remains and West’s physical characteristics. The remains were among 416 subsequently buried as “unknowns” in the National Memorial Cemetery of the Pacific (The Punchbowl) in Hawaii. 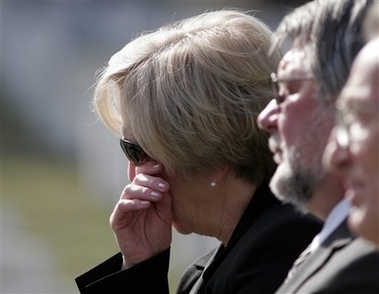 In May 2006, the Joint POW/MIA Accounting Command exhumed remains from The Punchbowl believed to be those of West. Although the remains did not yield usable DNA data, a reevaluation of the skeletal and dental remains led to West’s identification. The long journey of Private First Class Carl A. 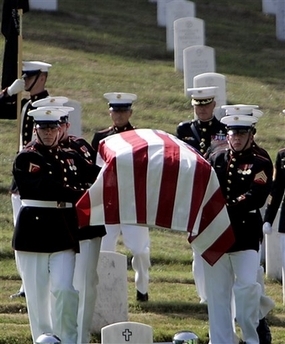 West, a U. S. Marine killed at age 23 in the Korean War, is finally over. 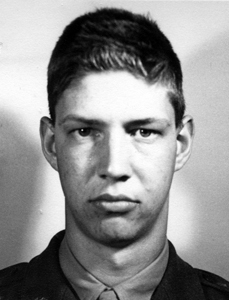 It took more than 56 years to identify the remains of the young man from Grays Harbor County. He died in the Battle of Chosin, in which 120,000 Chinese soldiers launched an attack on 19,000 U.S. troops. American Heritage magazine described the campaign "as grueling and heroic as any in history." With new forensic technology, which includes matching fingernail-size bone fragments, the Joint POW/MIA Accounting Command in Hawaii concluded it had a positive identification of West. He had been part of 416 "unknowns" buried at the National Memorial Cemetery of the Pacific in Honolulu. That means that now he will be buried with full military honors at Arlington National Cemetery. His nearest living relative is his niece, Valerie Bale, of Eagle River, Alaska. She was born three months after her uncle died. The Department of Defense has a long-standing policy to make "every effort" to recover military members who are missing, captured or died in combat. The department says that "the universal expectation that no one will be left behind is a fundamental article of faith." West, whose place of birth is simply listed as "Washington," but whose mother, Bessie West, had a general delivery address in Amanda Park in the Olympic Peninsula, was a member of a Marines weapons company. The Marines had been deployed near the Chosin Reservoir deep in what now is North Korea, when three Chinese divisions attacked. At night, the winter temperature was routinely 20 degrees below zero; sometimes it dropped to 40 degrees below. About 2,400 U.S. and allied troops died and 10,000 were wounded, according to one estimate. The Chinese suffered much more, with 40,000 killed or wounded. West was buried by his fellow Marines in a temporary United Nations cemetery in Hungnam, which fell to the North Koreans, said Larry Greer, spokesman for the Defense Department's POW/Missing Personnel Office. At the time of the burial, he said, a fingerprint of Mr. West was taken. Then, he said, in 1954 the remains of 2,944 U. S. soldiers were repatriated, including what were believed to be the remains of West. But staff at a U.S. Army mortuary found discrepancies between the dental remains and West's dental files, as well as discrepancies between the size of the bones in the remains and his medical records at the time. However, in May 2006 the remains were again exhumed, and this time he was positively identified. The niece and two others related to her will be flown, at the government's expense, to Washington, D.C., for the burial. 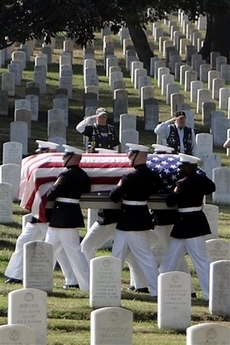 West's burial will include a U.S. Marine color guard, 21-gun salute and the playing of taps. Greer said that West's niece, as is the case with most relatives he contacts, was surprised at the efforts made to identify her uncle's remains. "They're amazed at the high-tech work we do, and they're amazed that the U. S. government has continued this kind of effort for 50, 60 years," he said. Jo Ann Miles didn’t know much about her father’s brother except that he had been in the Korean War and was missing in action. The Hoquiam woman knew her uncle’s name was Carl West and that her younger brother, Raymond Carl, had been named after her father, Raymond, and her uncle. The 45-year-old had never even seen a picture of her uncle — until she got The Daily World on Tuesday and saw a story about how Private First Class Carl West’s remains had been identified nearly 57 years after he died. The Department of Defense had a niece in Alaska as West’s primary next of kin and she was thought to be West’s closest living relative. Miles and her brother, however, live on the Harbor along with some of West’s great nieces and nephews. Miles said West also has some relatives in Oregon and Arizona. West lived in Amanda Park and went to Lake Quinault School before joining the Marines. He was the oldest of three children born to Amos and Bessie West. He was 23 when he died on December 8, 1950, in the Battle of Chosin Reservoir in North Korea. West, however, was among 416 “unknowns” buried at the National Memorial Cemetery of the Pacific in Hawaii after staff at a U.S. Army mortuary found discrepancies between the dental remains and West’s dental files. His remains were exhumed last year by the Joint POW/MIA Accounting Command and were identified after a re-evaluation of the skeletal and dental remains. 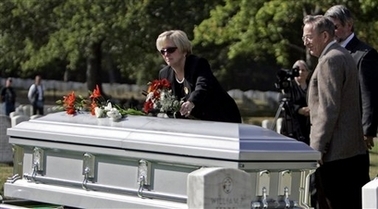 West will get a proper burial with full military honors at Arlington National Cemetery near Washington, D.C. on October 4, 2007. Thursday, October 4, 2007 at Arlington National Cemetery. 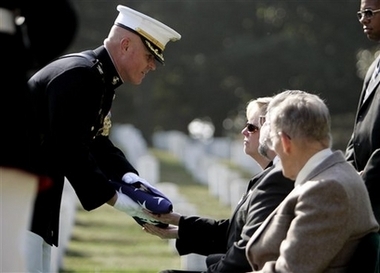 Thursday, October 4, 2007 at Arlington National Cemetery in Virginia.